Chicagoland junior and all-around good guy David Lombardo is headed to the Netherlands to compete in the UCI CX World Cup #1 this Sunday! 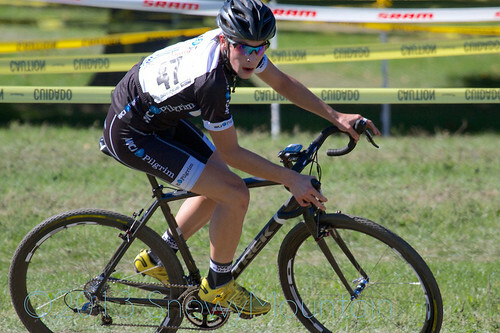 Before he crossed the pond, The Bonebell caught up with him to learn about his exciting cyclocross season ahead! David, you recently joined a new team, WCJ Racing. Will you tell us about it and how you were selected? What is the relationship between WCJ Racing and your road team, ISCorp? WCJ Racing is a new elite junior cyclocross team comprised of Andy Schmidt, Simon Jones, Sam Spende, Alex Dorschner, Garrett Roth, and myself. The team came about because the six of us were all on ISCorp for the past road season, and were all very interested in cyclocross. Billy Jones and Doug Close recognized the need for an elite cyclocross team and with help from others they organized WCJ Racing. The team will be riding the Trek Crockett with SRAM drivetrains, with title sponsorship provided by WCJ Pilgrim, and additional sponsorship from Gryphon Advisors, Intelligentsia Coffee, Spy Optics, Hincapie Clothing, Tartan Supply, and several other individual sponsors. 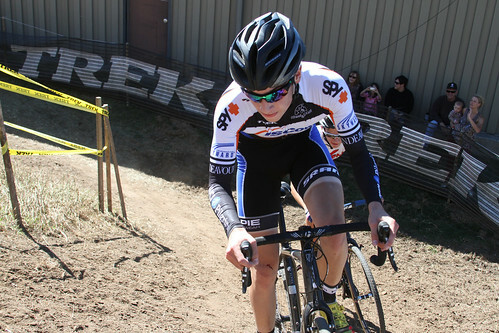 You were a fierce competitor in the Trek CXC Cup Sunday Men 2/3 race. Give us your play by play on the race, competition, and finish. 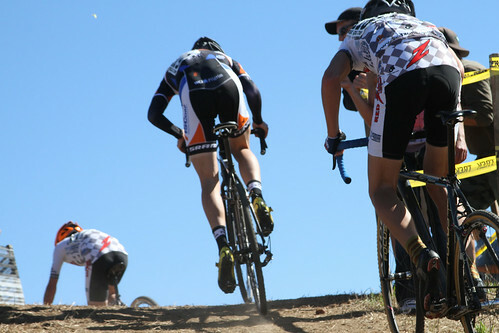 The Trek CX Cup was a very fun race, with a great course and venue. Josey Weik and Gavin Haley showed up so I knew that the race was going to be difficult. Quickly I found myself in a hole as I crashed on the first lap with Gavin on my wheel and Josey just a little bit behind us. I was able to recover quickly and bridge up to Gavin relatively quickly. Once I caught Gavin, Josey was joining the two of us too. For the next few laps they attacked over and over again. Then with four to go my bars slipped so I had to pit and get on my other bike. Quickly I realized that something was wrong, and that was that I had no rear brake. Then on the downhill chicane after the barriers I locked up my front brake and went flying over the handlebars. After that I lost contact with the leaders and just rode it to the finish from there. Great job on your first Pro 1/2/3 win at ChiCrossCup #1 in Jackson Park. Were you in the lead for the whole race? Who were your toughest competitors? Jackson Park was a ton of fun, and the course was very interesting but fun too. I do not believe I have ever raced a cross race with so many turns before. The race was between Doug Ansel, Brian Conant, David Reyes, and myself. Early on Brian, David and I had the lead, and then with about three laps to go Doug caught us, which is wicked impressive on a course like that. Then on the last lap Doug put in a huge attack. On the turns before the single barrier I was able to make a pass after which I took the lead into the last corner and held it to the line. You are headed to the Netherlands for the first CX World Cup race with USA Cycling. How did this come about? Do you think your experience at 2012 EuroCrossCamp will help you? When I went to Geoff Proctor’s summer USAC cyclocross camp I talked to him about the idea of heading over to Europe to do some World Cups. He thought that it was a good idea and told me to put in a petition for the World Cup team. Then a couple of weeks ago I found out from Mark Gullickson that USA Cycling was going to take a couple of juniors to the first World Cup in Valkenburg. USA Cycling is sponsoring the trip, but WCJ is helping a lot by getting me over there. EuroCrossCamp is a great experience and you learn so much from Geoff Proctor and just from racing over there. Also from doing the races over there you get more comfortable with the whole idea of racing in another country. Do you hope to attend EuroCrossCamp again this year? If so, what skills do you want to define? EuroCrossCamp is a big goal of mine again this year, as no one is guaranteed a spot to attend the camp. So the first thing that I need to focus on is being selected. If I do attend the camp again I think the main thing that I would like to improve upon is being professional about everything. Those two weeks over there are one of the few times when all I have to worry about is bike racing, so I would like to take the opportunity to do just that. Any thoughts on Worlds this year? Being selected to go to Worlds again is a huge goal of mine. Most of my schedule is based on trying to be able to go to Worlds in Hoogerheide Netherlands. If I am chosen for Worlds again this year my main goal would be to improve on my result from last year in Louisville. Best of luck in Valkenburg this weekend, David. We will watch you on the UCI LIVE WEBCAST and cheer loudly! You have earned many supporters in Chicago and beyond who look forward to seeing what this season has to offer – and down the road! Follow David on Twitter @DavidLombardo2 and at the WCJ Racing Facebook page.